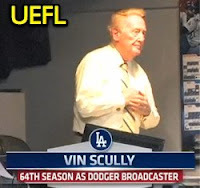 Vin Scully struck again Friday, praising another umpire for a superb call—this one going against his hometown Dodgers to deny Los Angeles its first run in a 0-0 ballgame and prompting an argument from LA manager Don Mattingly. Thanks to KJW for spotting the compliment du jour. On Thursday, it was Scully who received accolades and affection as the Dodgers celebrated a sold-out Vin Scully Bobblehead Night. Halfway through the game, the club aired a Scully tribute video and when it ended, fans broke into a round of thunderous applause and honored the veteran broadcaster with a minute-plus standing ovation. Even umpire Ted Barrett and his crew of Scott Barry, Mike Muchlinski and Alfonso Marquez saluted Scully for a good 30 seconds. On Friday, it was Scully honoring the men in black. With one out and two on (R1, R3) in the bottom of the 4th inning of a scoreless Reds-Dodgers game, Dodgers batter Juan Uribe hit a 3-2 fastball from Reds pitcher Homer Bailey on the fly to right field where it was caught by Jay Bruce and thrown home to catcher Corky Miller as R3 Hanley Ramirez ran from third base to score on the sacrifice fly. Replays indicate Miller missed an initial tag attempt as Ramirez missed home plate. Miller appeared to tag Ramirez's thigh upon an attempted return to touch home. "High fly—this is going to be interesting—Hanley tags, Bruce with that good arm, here is the throw—up the line, no tag, but he missed home plate I think and he is out at the plate! Corky wouldn't give up. Hanley ran around, missed the plate and Corky came back and got him." Always talking about ballplayers—great hit here, great catch there—that was a great call by Alfonso Marquez, the plate umpire. Here is the strong throw by Bruce up the line. You will see no tag, but also no touch at home plate. Hanley was tagged on the foot and again on the leg and Marquez in perfect position...a perfect call by Alfonso Marquez. Way to go Alfonso! Marquez, umpiring in the big leagues for 14 1/2 years, he was born in Mexico and lives in Arizona. First ever Mexican born umpire to make it to the Major Leagues and after watching him circulate around home plate to make the call, you can understand why. Marquez rules an out at the plate. About Miller, Scully added: "And bless his mother's heart, with a middle name of Abraham, he can still run for president" though he also pointed out, "with a mustache like that, he could certainly be the villain." Just as it is on the field and between the lines, for every erroneous broadcasting call (or two/few), there is a gem turned by a true Hall of Famer. Oh lord, Vin, why couldn't you have been an Orioles' announcer. Timmons is usually okay but tonight was downright awful. I don't know if Diaz and Timmons should be on the same crew. The pitch was not even close, but David should not have smashed his bat against the dugout phone. That could have caused serious injury. Well, when you decide at the delivery of the pitch you are going to just stand straight up and not even attempt to stay in the box, your zone gets bigger. That ball technically crossed him around the belt. Close enough pitch in any fashion, but when you just stand there, yeah its a strike. As alluded to here, because of Ortiz's actions in standing tall, the top of his strike zone increased in height significantly.